This home, designed for a family with two young children, has two levels plus a basement. The living/dining area & kitchen, the two parents' studies, powder room, and master bedroom suite are located on the upper level. The ground floor houses the family room, three bedrooms, one bathroom and a 1-car garage. The small lot is on the corner of two quiet streets; a broad, existing oak tree in the front yard provides shade and screening in the summer. 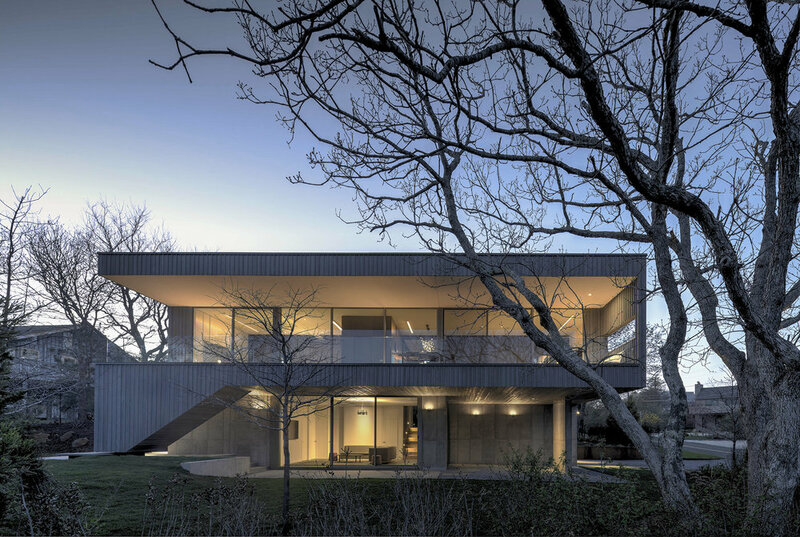 The house was designed to promote family interaction with easy flow between indoor and outdoor activities and clear sight lines across large sections of the home. Three terraces allow family activities to spill out to the outdoors. One is a "garden" terrace that connects the family room to the landscape. A second, "reading" terrace is shared by the parents' studies. The third, "breezeway" terrace spans the living/dining areas & kitchen. Covered by a cantilevered roof, it allows the family to live and dine outside, essentially doubling the size of the living/dining areas in the summer. The house facade is a combination of exposed concrete and shou sugi ban- a rainscreen of wood that lets the facade breathe. Shou sugi ban is a traditional Japanese process of burning the surface of wood to make it rot-proof and bug-resistant. The wood color and texture reference vernacular Montauk architecture while articulating an iconic, crisp, modern form. The wood wraps into the interiors, framing the living spaces on the upper floor and cascading down the staircase to the family room. End grain wood floors and an exposed “zipper” of beams along the spine of the house reinforce the rugged aesthetic of the home. All of the materials in the house were selected for ease of maintenance and durability for an active family (as well as the way each of the materials contributes to the textural design palette). The design seamlessly integrates several sustainable design strategies. The roof of the house conceals a large photovoltaic array with enough power storage to run the entire home. To reduce the use of air-conditioning, we positioned windows and the central stairwell to take advantage of natural ventilation from prevailing winds. Shade from the large cantilevered roof and the "breezeway" terrace also help to reduce solar heat gain from the sun's rays on both floors.